According to the Center of Volcanology and Geological Hazard Mitigation (CVGHM), Lamongan has not erupted since 1898. On several occasions since then, however, seismic activity has increased. Brief periods of earthquakes and earthquake swarms occurred in 1924-25, 1978, 1985, and 1988 (SEAN 10:10, 10:11, 13:02). The Darwin Volcanic Ash Advisory Centre (VAAC) reported on 24 September 2003 that aircraft personnel had observed ash over the volcano to a height of about 900 m, but this was not confirmed by on-scene observers (BGVN 28:12). Our previous report noted continuous tremor and an earthquake swarm on 5-6 January 2005 (BGVN 31:01). CVGHM reported that during 1 February-9 March 2012, diffuse white plumes rose at most 20 m above Lamongan's crater. Seismicity increased on 23 February, then fluctuated in intensity through 7 March. Seismicity increased significantly on 8-9 March (table 1). CVGHM raised the Alert Level to 2 (on a scale of 1-4) on 9 March, and began to monitor the volcano more intensively. Residents and tourists were prohibited from going within a 1-km-radius of the active crater. No eruptions occurred during the reporting period. Increased seismic activity at Lamongan continued at least through 12 March. Table 1. Seismicity at Lamongan during 1 January-9 March 2012. Data from CVGHM. Shallow volcanic earthquakes were not reported and categories were not defined in the reports. Information Contacts: Center of Volcanology and Geological Hazard Mitigation (CVGHM), Jalan Diponegoro 57, Bandung 40122, Indonesia (URL: http://www.vsi.esdm.go.id/); Darwin Volcanic Ash Advisory Centre (VAAC), Bureau of Meteorology, Northern Territory Regional Office, PO Box 40050, Casuarina, NT 0811, Australia (URL: http://www.bom.gov.au/info/vaac/). According to a report from aircraft personnel, on 24 September ash was visible rising to ~900 m above Lamongan. Ash was not visible on satellite imagery. "Lamongan experienced a seismic swarm with ground breakage 2-15 October. More than 3,000 earthquakes were recorded at the VSI observation post at Gunungmeja, near Klakah, W of Lamongan (figure 1). Two additional seismometers were installed in the epicentral area on 5-6 October. Ground breakage occurred in a region ~5 km W of the summit and consisting of numerous ground cracks, some with vertical offsets of 15 cm, striking ENE. No changes were noted in the temperatures or character of the many lakes in the Lamongan area, which fill maars created by prehistoric eruptions. The 1985 activity is in the same general area as two seismic swarms that occurred in 1924-25 and in 1978 but did not culminate in eruptions." Figure 1. Map of Lamongan, after Van Bemmelen, 1949. Contour interval is 250 m. Contours on the W side of the map mark the lower E flank of Tengger Caldera. Fissures shown are from the 1924-25 earthquake swarm. "Lamongan was quite active during the 19th century with 40 eruptions, including more than a dozen that produced lava flows. Most were from vents located on the W flank above about 400 m altitude. It is notable that the maars on the W slope of Lamongan all occur at elevations below the historic eruption vents, suggesting that the position of the groundwater table controls its eruptive style. Eruptions from above 400 m altitude form fissure vents and cinder cones that pose little threat to the local inhabitants. Activity from vents below 400 m may give rise to explosive, maar-forming eruptions. The 1985 epicentral area has a surface elevation of 200-380 m. Plans are underway to increase the level of surveillance." Reference. Van Bemmelen, R., 1949, The geology of Indonesia, v. 1B: M. Nijhoff, The Hague. Information Contacts: J. Matahelumual, Suparto S., and T. Casadevall, VSI. "November activity consisted of an average of one earthquake/day in the October swarm area W of the volcano. Detailed geological and monitoring efforts are now in progress by VSI to evaluate the possibility of a future eruption from the epicentral area." A brief seismic swarm centered immediately W of Lamongan cone began on 8 February at 0445. Additional seismicity was recorded through February. No changes have been noted in the temperature or behavior of the maar lakes within the epicentral region. The earthquakes occurred in virtually the same epicentral area as those from the 1978 and 1985 swarms. When last discussed in 1988 (SEAN 13:02), a seismic swarm had occurred here. Except for an uncertain 1953 eruption, 20th- and 21st-century eruptions are unknown. Darwin Volcanic Ash Advisory 2003/1 notified aircraft personnel that, on 24 September 2003, ash was visible to ~ 900 m over Lamongan. In this 2003 case, no confirmations of a plume or other signs of volcanism were available from observers on the scene. Concrete confirmations can establish that the plume did indeed vent here, rather than at another volcano and that it did not result from similar-looking processes of non-volcanic origin (eg., forest fires, crop burning, lofted dust). Elevated seismicity occurred at Lamongan on 5-6 January 2005. From 1200 to 0700 on 5 January, 22 events occurred with Modified Mercali Intensity (MMI) of 1. At each of three times (0331, 0447, and 0524) observers noted an event of MMI 3. During this period, instruments detected continuous tremor with an amplitude of 3 to 15 mm. On 5 January there were 282 local tectonic earthquakes and 53 volcanic A-type earthquakes. The volcano alert level was raised to 2. On 6 January 2005, 107 volcanic A-type earthquakes were recorded. Local tectonic earthquakes over the two day period occurred 159 times, of which 10 of them were events had Modified Mercali Intensity (MMI) of 1-3. Lamongan, a small stratovolcano located between the massive Tengger and Iyang-Argapura volcanic complexes, is surrounded by numerous maars and cinder cones. The currently active cone has been constructed 650 m SW of Gunung Tarub, the volcano's high point. 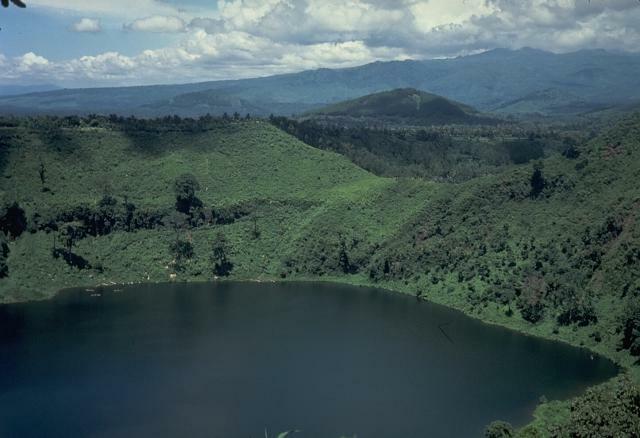 As many as 27 maars with diameters from 150 to 700 m, some containing crater lakes, surround the volcano, along with about 60 cinder cones and spatter cones. Lake-filled maars, including Ranu Pakis, Ranu Klakah, and Ranu Bedali, are located on the E and W flanks; dry maars are predominately located on the N flanks. None of the maars has erupted during historical time, although several of the youthful maars cut drainage channels from Gunung Tarub. The volcano was very active from the time of its first historical eruption in 1799 through the end of the 19th century, producing frequent explosive eruptions and lava flows from vents on the western side ranging from the summit to about 450 m elevation. Bronto S, Situmorang T, Effendi W, 1986. Geologic map of Lamongan volcano, Lumajang, East Java. Volc Surv Indonesia, 1:50,000 geol map. There is data available for 42 Holocene eruptive periods. Remarks: Shallow-sourced inflation at Lamongan has so far not resulted in eruption. There is no Emissions History data available for Lamongan. Lamongan, a small 1631-m-high stratovolcano located between the massive Tengger and Iyang-Argapura volcanoes, rises above Lamongan Lake on its western flank. 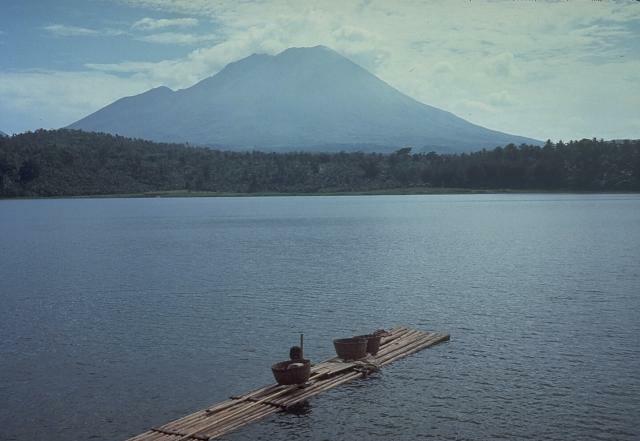 Ranu Lamongan lake fills one of 27 maars that surround the volcano; they have diameters from 150 to 700 m. Lamongan produced frequent explosive eruptions, mostly from the summit crater, during the 19th century. 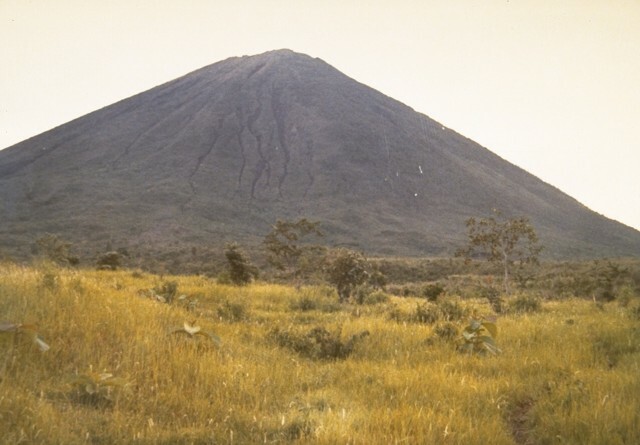 The Gunung Anyar cinder cones were formed during an eruption in 1898 at 400 m elevation on the SW flank of Lamongan. The eruption began on February 5. Activity slowed by the 7th, but included the emission of two small lava flows, the largest of which traveled 300 m by the time it stopped on February 15. 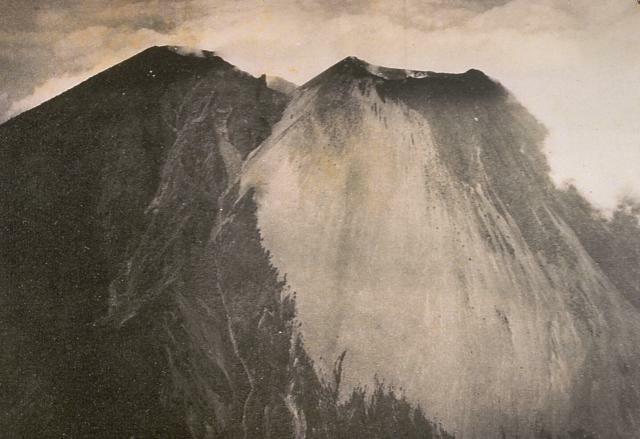 Lamongan volcano as viewed from the west shows the forested summit of Gunung Tarub, forming the highest point on the volcano, on the left with a younger, sparsely vegetated cone (Gunung Lamongan) constructed to the SW. The vertical dashed line locates a volcanic spine in the summit crater, which has been the source of most historical eruptions from Lamongan. This lake-filled maar on the NE flank of Lamongan is one of 27 surrounding the volcano. Most historical eruptions have originated from the summit crater of Lamongan. Photo by Tom Casadevall, 1987(U.S. Geological Survey). 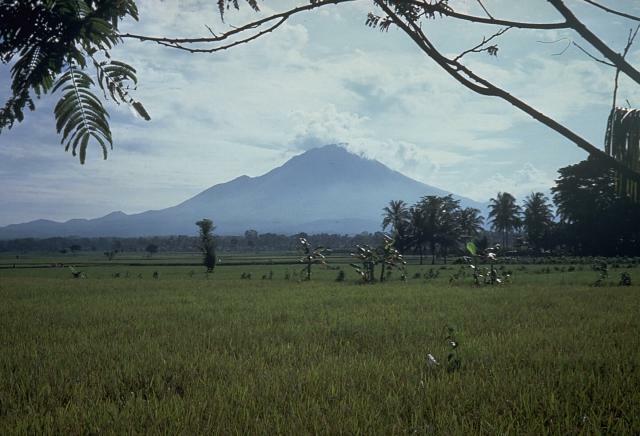 Lamongan is a small, 1651-m-high stratovolcano located between the massive Tengger and Iyang-Argapura volcanic complexes. A cluster of 27 maars, many filled by lakes, and 37 cinder cones surround the volcano. 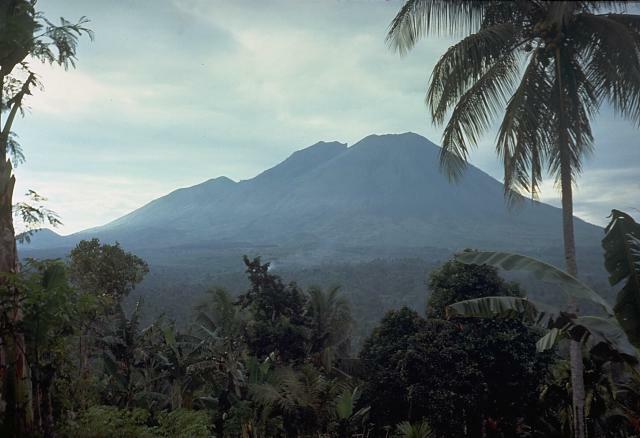 The younger, smooth-sloped cone in the right foreground was constructed to the SW of Gunung Tarub, the volcano's highest peak to the left. Lamongan was frequently active during the 19th century, producing both explosive eruptions and lava flows. Lamongan is a small, 1651-m-high stratovolcano located between the massive Tengger and Iyang-Argapura volcanic complexes. A cluster of 27 maars, many filled by lakes, and 37 cinder cones surround the volcano. 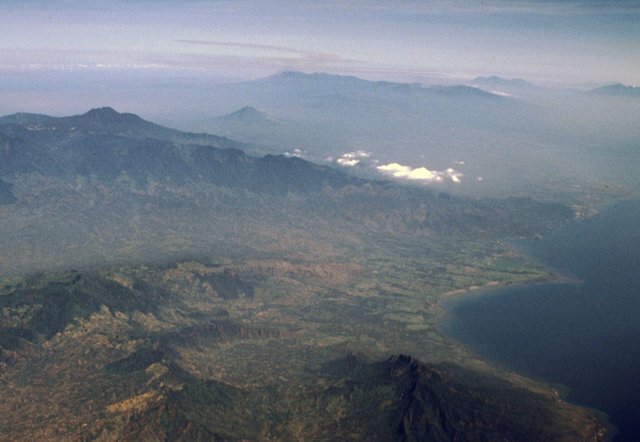 Lamongan, seen here from the north, was frequently active in the 19th century, producing both explosive eruptions and lava flows. 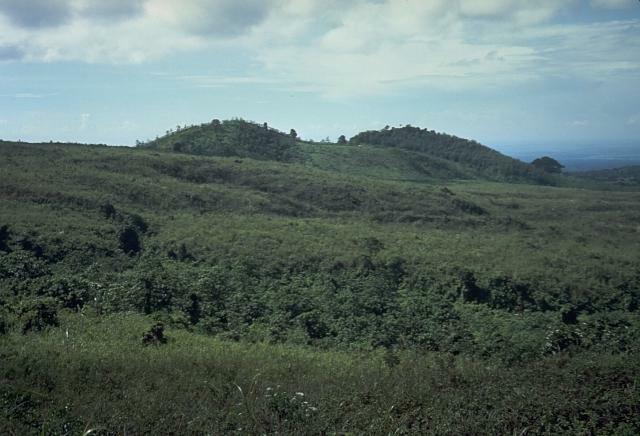 The sparsely vegetated slopes of Gunung Lamongan, the younger of two summit cones forming Lamongan volcano, rise above grasslands at the western flank of the volcano. There are no samples for Lamongan in the Smithsonian's NMNH Department of Mineral Sciences Rock and Ore collection. Large Eruptions of Lamongan Information about large Quaternary eruptions (VEI >= 4) is cataloged in the Large Magnitude Explosive Volcanic Eruptions (LaMEVE) database of the Volcano Global Risk Identification and Analysis Project (VOGRIPA).